Online selling is very popular these days because people around the world can buy from the same site at the same time. The geographical location of the customer does not matter anymore. Whether someone lives in a small village in Africa or in a big city like New York, products can be purchased and delivered with the help of e-commerce websites. Selling your merchandise online is a great idea, but you must be very careful to bring the customers to your site. There are many e-commerce websites out there, but if you look closely, you will realize that only a few of them are actually successful. The major reason behind less ROI is website design issues. You may have great products and your rates can be very cheap, but if your e-commerce website design is not up to the mark, you won’t be able to increase the conversion rate. If you are planning to develop an e-commerce website and attract thousands of customers, don’t make the mistakes mentioned below. # Not enough product details: Buying something from a shopping mall and a website are two completely different experience. When people buy from a store, they get the opportunity to experience the product. The store owner explains the benefits of the product. On the contrary, when they buy from an e-commerce site, they read the product description to evaluate the pros and cons of it. So, if you do not provide enough details, they may never buy the item. Let’s assume that you are selling garments online. Buyers would like to see size, colour and material of the garment to take the buying decision. # Forget to display the shipping charges: After selecting an item, customers like to know how much you will charge them for product delivery. Therefore, clearly mention the shipping charges. If you offer free shipping, highlight it using a bold, colourful text to make sure everyone notice the facility. # Lack of contact information: One of the first things that customers look into is the contact information. Place your contact information near the header area of the site so that customers can see it immediately. Don’t forget to include various contact options. Only office address and phone number are not enough. You should give email address, FAX number and if possible incorporate a live chat facility. # Not earning the trust of customers: When it comes to paying online, customers are very sceptical. They don’t like to share their credit card or online banking details unless they are absolutely sure about the security features of your site. Therefore, you must highlight the security certificates acquired by your company. Convince the buyers that their banking details will be completely safe. # Low quality images: Since customers can’t touch a product online, they judge its quality by looking at the visuals. If the images of a product are not convincing enough, they will not click the “buy now” button. Therefore, use only high resolution images and edit the images before uploading to make them eye catching. Also, show the product from different angles to help customers get a better understanding. # Poor call to action: While designing the site, you must remember that both experienced as well as first time customers will visit your site. Hence, design the site in a manner that even a novice buyer can surf confidently. Call to action message needs to be absolutely clear. Visitors should understand what you want them to do. Some sites mention “add to basket” or “add to cart” as call to action, but it is not a very clear message. Instead, if you write “click to buy” on the call to action button, even the most inexperienced customer will understand. # Lengthy checkout process: Nobody likes to fill-up a long form to complete the buying process. Keep the forms brief and ask for only necessary information. Also, help the visitors during the form fill-up process. For example, you can mark a field red if the customer types anything wrong. # Unorganized navigation: Web users don’t like to waste time while searching for a product. The quicker you can help them reach their desired items, the better chances of conversion you have. Therefore, you should design the website navigation intelligently. Use a drop down menu and organize products into categories and sub-categories. Also, it is essential to embed a search tool with auto-suggestion facility. If users type a word, the search tool should suggest the matching product. # Tiny fonts: This is the mistake that most web designers overlook while developing an e-commerce website. People read the product descriptions first and then take the buying decision. If the font size is too small, potential customers will get irritated and leave the site without buying anything. Use minimum 12px font size for general content and a larger size for product names, special offer etc. # Invisible cart information: Some people come to an online store to buy multiple items and they may have a fixed budget. When the buyers start adding products one after another, they either forget to see the total amount or worry too much that the total cost may cross the budget. Never keep your customers confused. Shopping cart information must remain visible all the time, irrespective of the users’ webpage location. Place the cart info at the top right corner of the website. Make sure that it shows both the number of items purchased and the total amount. # Not adding a FAQ page: Customers have several questions in their mind when they visit an e-commerce website for the first time. Some of the common questions are “what are the payment options?”, “what is the refund policy?”, “how much is the shipping charge?” and many more. You must add a FAQ page containing the answers to these questions. As long as you maintain a transparent image, people will return to your site for buying their favourite products. 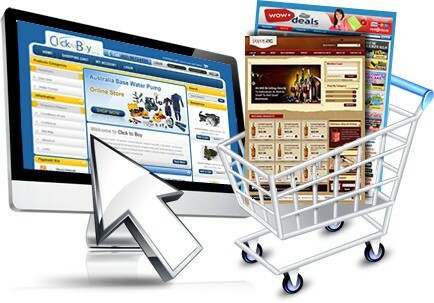 It takes creative imagination and experience to design an e-commerce website. As a designer, you must think from the visitors’ perspective to create an attractive and user friendly web shop.